'Cashew Fruit' comes from Brazil, spread in the tropics and is found at an altitude of between 1-1200 m above sea level. 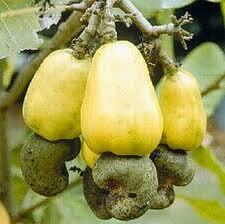 'Fruit Cashew' will bear fruit better in dry climates and rainfall less than 500 mm per year. This plant can grow in all kinds of soil, provided it's not the land of dense clay and waterlogged. Tree, 8-12 m tall, has a lot of branches and twigs. Curved rods, woody, resinous, branching from the base. Single leaves, stemmed, from 4 to 22.5 cm long, 2.5 to 15 cm wide. Strands of leaf-shaped 'oval breech', edge of the flat, base tapering, rounded tip with a small indentation in the middle, 'bone leaves' pinnate, green. Flowers married one has a 'female interest' and 'male flowers', composed of panicle, out in the 'armpit leaves' or the 'tip of the branching'. The fruit of stone fruit, hard, curved. Fruit stalk bubble over time will become apparent that soft fruit, such as peer fruit, yellow, sometimes red-stained, slightly sour sweet taste, contains a lot of water and fiber. Seed long round, flat curved, dark brown color. The wood can be used as building materials, household appliances, and crafts. Bark is used in the batik industry or for tanning materials. The young leaves can be eaten as a vegetable (raw or steamed first). Artificial fruit taste sour and can be eaten as a salad, made ? ?drinks, wine and jam. If it is processed, the price of 'seed cashew' is quite expensive, known as the 'cashew'. Skin seeds containing cashew nut shell liquid (CNSL). If the liquid is on the mouth can cause inflammation. Once processed, CNSL can be used for lubricating materials, insecticides, varnishes, plastics, enten or grafting. 'Bark' smell is weak, it feels natural brown and eventually creates a feeling of thickness on the tongue. Usefulness as a laxative, astringent and stimulate digestive enzyme activity (alteratif). Leaves aromatic smell, taste sour, efficacious anti-inflammatory and decreased blood glucose levels (hypoglycemic). Seeds efficacious as a skin softener and pain relievers (analgesics). Roots efficacious as a purgative (laxative). 'Bark' contains a lot of tannin, tannic substances, acid ginkol error and catechins. The leaves contain tannin-gallate, flavonols, anakardiol acid, elagat acid, phenol compounds, 'kardol' and 'methyl kardol'. Fruit contains protein, fat, vitamins (A, B and C), calcium, phosphorus, iron and sulfur. Percarp contains tannin, acid and acid anacardic elegat. Seeds contain 40-50% oil and 21% protein protein. Oil contains oleic acid, linoleic acid and vitamin E. The sap contains furtural. Acid anacardic efficacious bactericidal, fungicidal kill worms and protozoa. Parts used are the 'bark', beans, oil seeds, seed coat, young leaves and fruit. For drugs taken, boiled 10-20 g bark, and drink boiled water. For external treatment, milled bark until smooth, then Dab on the affected part of venomous snake bites or clavus (thickening of the skin, usually occurs on the palms and soles of the feet). Alternatively, grind 'fresh leaves' till smooth and put on burns, blisters, teeth and gums are sore. For treatment of ulcers, syphilis, leprosy, psoriasis, eczema, skin and cracked feet, boiled, the skin is still fresh beans until the water thickens, then apply on the wound. 2. Active Anticancer against hepatoma129 in mice. Effects such as that caused by morphine and phenothiazine in albino rats. Securities extension reaction in mice. These effects occur at doses of 30 ml / kg bw. Most likely, this situation caused by the active substance is efficacious analgesic, such as morphine or metamizol. Specifically, infusion 'cashew leaf' with a rate of 50 cc / kg body weight given intra-peritoneal in white rats can inhibit the escape of conditional avoidance response in 87% of animal experiments. On the other hand, control mice that were given salt physiology has not obstacle. Infusion 'cashew leaf' with a dose of 6 and 12 g / kg bw showed no significant anti-inflammatory effect (p <0.05), the second hour after administration karagenin. Presentation inhibition of edema 'cashew leaf' (26.86%) was much smaller than demham sodium diclofenac (41.72%). Infusion 'young cashew leaves' have an equally strong analgesic effect with paracetamol in cases of acute periodontitis. Side effects include nausea and dizziness. Wash 10g 'cashew bark' thoroughly, then boiled in 2 cups water for 20 minutes. Once cool, strain and filter drinking water, daily 2 times as much. Wash 15g 'cashew bark' thoroughly, then cut into pieces as needed. Boil the remaining 3 cups water to one cup. After the cold filter and filter drinking water, daily 2 times each 1 / 2 cup. Wash 5 pieces of pseudo 'cashew' to clean, and scar. Add 4 tablespoons of cooking water and 2 tablespoons of honey, stirring evenly. Squeeze the potion, then strain. Use water to rinse the filter (direct swallowed), 3 times a day, each 2 tablespoons. Wash a handful of young leaves and a piece of 'cashew bark' thoroughly, then boiled in 1 liter of water to boiling (for 15 minutes). Once cool, strain and filter the water ready to drink. Treatment carried out 2-3 times a day, each 1 cup. The water is also used to rinse his mouth. Sliced ​​handful 'cashew leaf', then boiled in 3 cups of water until remaining 1 glass. Once cool, strain and filter drinking water, daily 2 times, each 1 / 2 cup. Saute a few 'cashew fruit' which contain seeds until the outer skin yellowing to eliminate toxins that can cause skin irritation. After the yellow, remove the seeds. Sun to dry, then milled until smooth. Use this mixture to sow injury from poisonous snake bites. Saute 5 pieces of 'nuts' dry until yellow, then milled into powder. Take 1 teaspoon of the powder, then add 1 / 4 teaspoon honey. Stir until blended, and Dab on a perforated teeth or around the gums are inflamed. In botany, 'cashew fruit' which is actually the fruit of 'his nuts' (nuts), while the fruit is usually dirujak is 'the fruit stalk' the swollen and fleshy. Gum seed skin (pericarp) contains kardol poisonous and can cause skin irritation. If someone is issued a 'nuts' by way of biting 'outer skin of the seeds', will feel the heat and tenderness due to irritation in the lips and oral mucosa.